There's plenty of space for cooking on this 90cm wide hob from Smeg, with 6 burners including 2 ultra rapid burners for extra power and flexibility. The stainless steel base is designed to be ultra low profile, ideal for a modern, sleek kitchen. 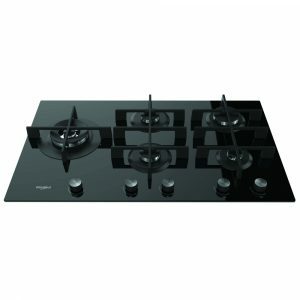 This 90cm wide hob from Smeg looks fantastic, finished in black glass with clean lines and great design. There are 5 gas burners allowing you to cook with the control and power that gas is popular for, and there's even a strong ultra rapid burner for that extra heat! 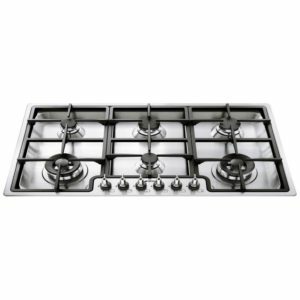 This superb 90cm wide gas hob from Caple boasts five gas burners, including a powerful triple ring burner, with cast iron pan supports. Finished in black glass with stainless steel trim it will look great in any kitchen. 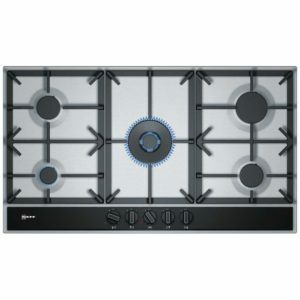 This superb 90cm wide gas hob from Smeg boasts five gas burners with cast iron pan supports. Finished in stainless steel it will look great in any kitchen. 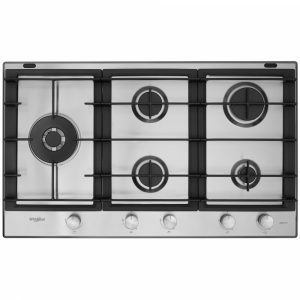 This superb 86cm wide gas hob from Whirlpool boasts five gas burners. Finished in stainless steel it will look great in any kitchen. 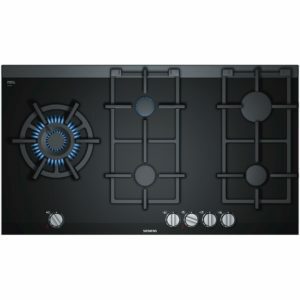 Cook up a storm with this extra wide gas hob from Siemens. Boasting 5 gas burners including a wok burner with dual flame system, this hob is ideal for a wide variety of foods, even in large quantities. The dishwasher proof pan supports are extremely easy to remove and keep in great condition and the glass cooktop is heat-resistant and really easy to clean. Finished in black ceramic glass with steel finish controls this hob not only performs but looks great too! What's more the ER9A6SD70 comes with a 2 year warranty. 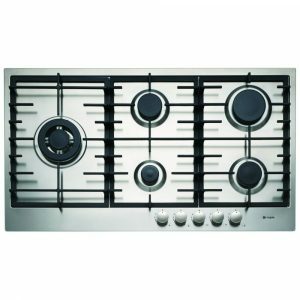 This superb 90cm wide gas hob from Smeg boasts five gas burners, providing the fine control and power that gas cooking is popular for. Boasting cast iron pan supports and finished in stainless steel it will look great in any kitchen. 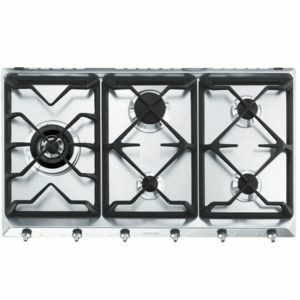 This fantastic gas hob from Caple looks amazing, with its stainless steel finish and cast iron pan supports. There are 5 gas burners, including the triple burner ring, so you have plenty of options whether you need to boil, fry or simmer. 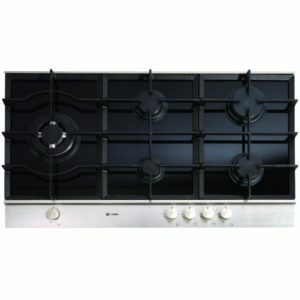 This superb 86cm wide gas hob from Whirlpool boasts five gas burners with cast iron pan supports. Finished in black glass it will look great in any kitchen. This superb 90cm wide gas hob from AEG looks outstanding, finished in stainless steel, with cast iron pan supports and a black glass control panel. Rotary controls ensure that use is hassle free, and as they light up when in use, you will be able to tell at a glance which dial you need to adjust. With 6 burners, each designed to maximise the flame that reaches the pan, including the triple crown wok burner, complete with wok support, you will have plenty of room for even the largest of pans. 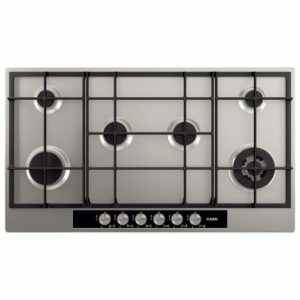 This stunning 90cm wide stainless steel gas hob from Neff boasts five gas burners with cast iron pan supports and adjustable FlameSelect controls. FlameSelect allows you to precisely adjust the flame in 9 steps, giving you reliable and precise power levels for outstanding cooking convenience. This hob also features a 7 segment display with residual heat indicator which provides a digital display of the power level selected. 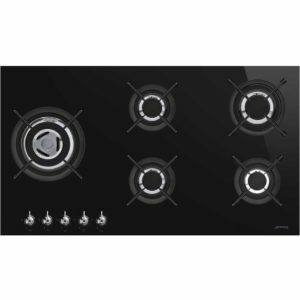 Once you've turned the hob off the indicator informs you of the cooking zones residual heat.This hob would look superb in any kitchen. With the option to install this hob flush or inset, you can choose the best option for your kitchen, and thanks to its stainless steel finish and cast iron supports it will add a stylish feature. 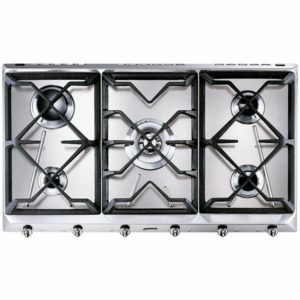 With five gas burners including a powerful triple ring burner, you will be able to choose the perfect heat for every meal. The tried-and-tested gas hob is a classic feature of most kitchens. If nothing from our above range is grabbing you, consider some of our other options. They’re all to be found in our hobs collection. With induction hobs, and even air venting induction hobs, the future of hobs is here. 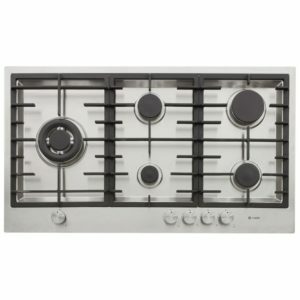 Our cooking page also has selections of range cookers and built in ovens for you to check out. Pair it with one of the powerful cooker hoods from our extraction section. If your whole kitchen could do with an update, then have a look at what we have to offer in our refrigeration and small appliance sections, including our line of American-Style fridge freezers or our fantastic coffee machines. Make savings when you upgrade your kitchen equipment today at Appliance City.